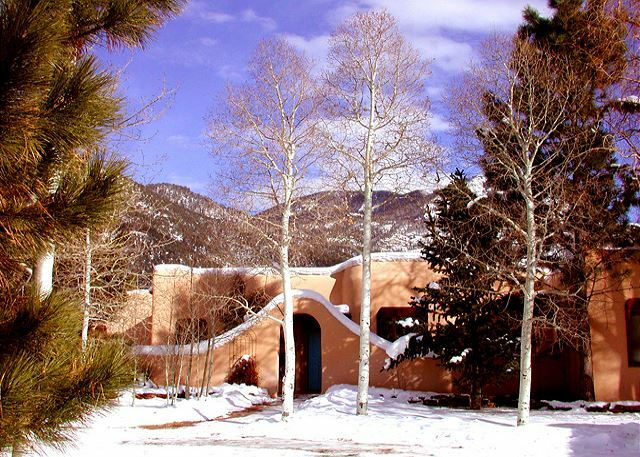 GREAT VIEWS - Central Evaporative Cooling, private yard, acequia stream, covered deck, mountain views, gourmet kitchen, private hot tub, 3 TV's, Wi-Fi, Los Altos Club House pool & tennis. 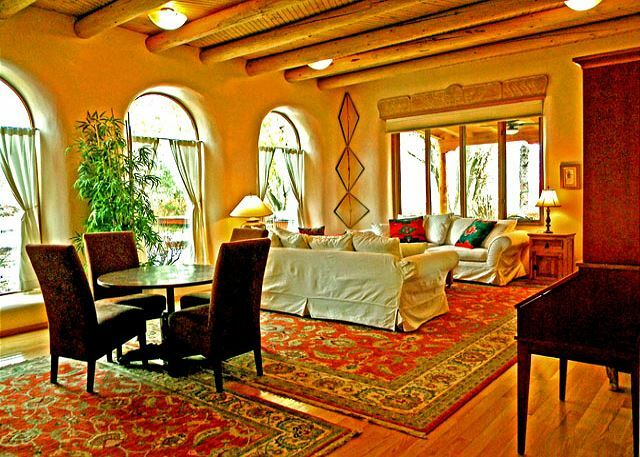 Taos Casa Bella - an upscale, custom built adobe view home, in the prestigious Los Altos community of Taos, New Mexico is located off Taos Ski Valley Road half way between town and the slopes. 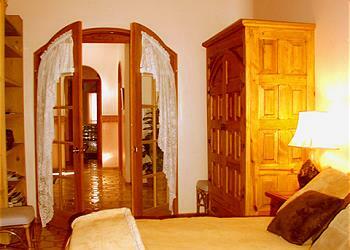 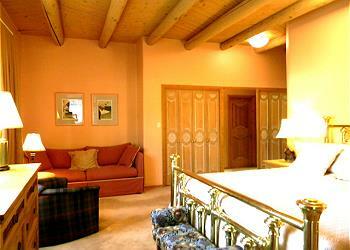 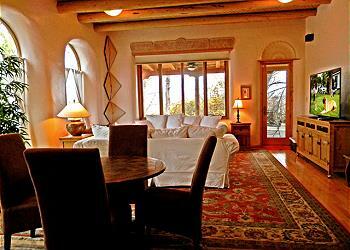 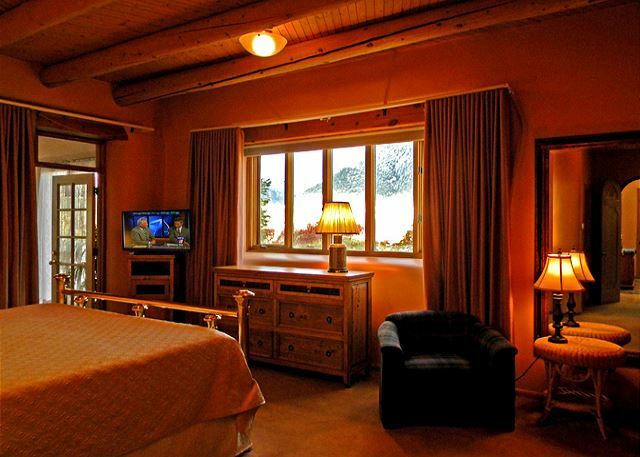 Guests enjoy eclectic Southwest / French Country charm, tasteful furnishings and 4 king bedrooms. For flexible sleeping arrangements, the den bedroom King bed can be converted to 2 twins. Be sure to notify caretaker long before arrival should your group require twins. 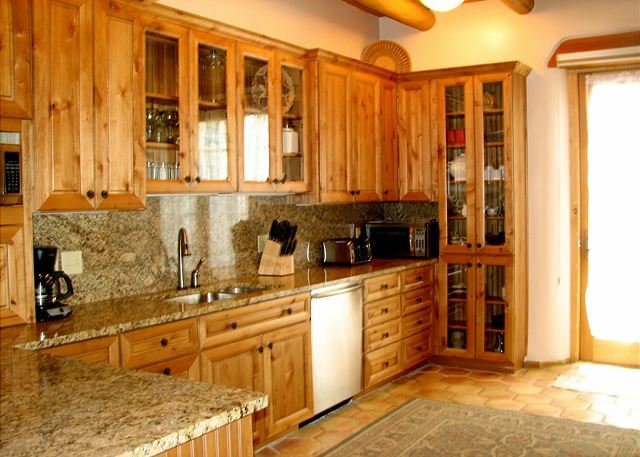 A recently remodeled country kitchen with granite counters and custom crafted knotty alder solid wood cabinets, Wolf commercial oven/range delight both the novice cook and the gourmet chef. 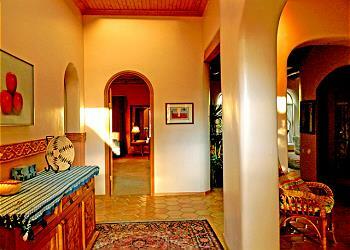 Radiant heated floors add to the quiet comfort and ambiance of this spacious, light and bright home. 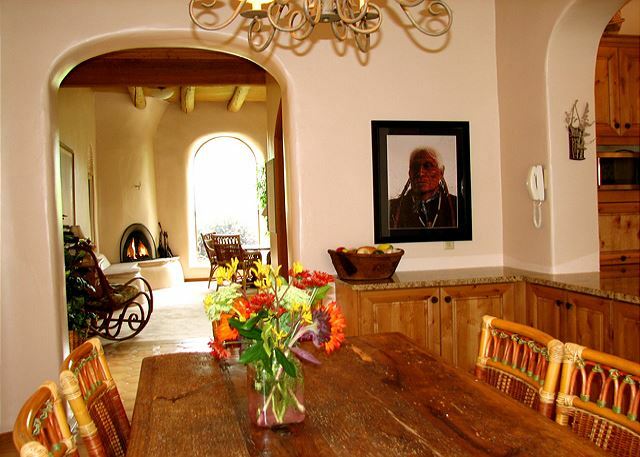 4 bedroom and 4 bathroom sleeping 10 guests (or 12 to 14 guests with special arrangements including the cabin / casita / studio guest house). 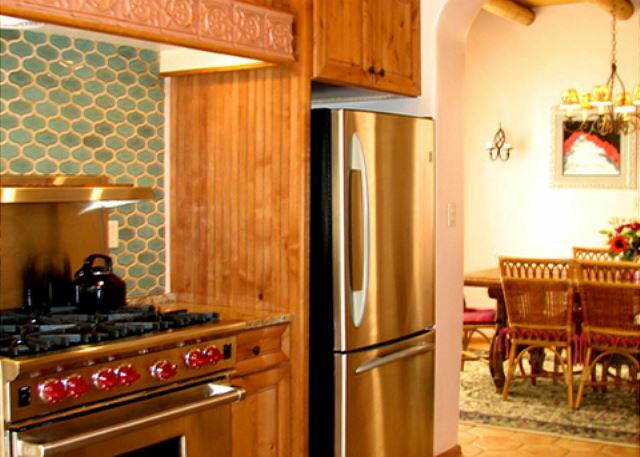 Amenities include a well-equipped gourmet kitchen with Wolf oven / range, 3 Direct Satellite TV's (with 31 continuous play music channels and many free movie channels), washer and dryer. 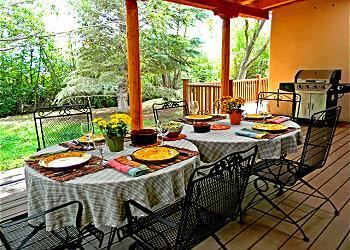 The professionally landscaped yard offers privacy, a lovely babbling brook (acequia irrigation stream). 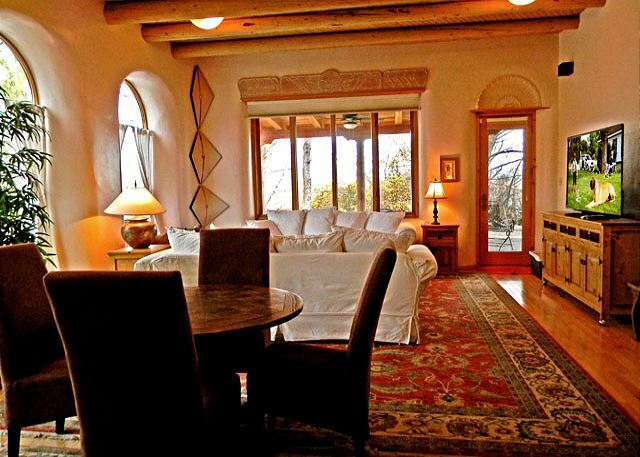 A jumbo covered deck 14 ft. x 52 ft., overlooking the acequia stream extends living space in a very private back yard. 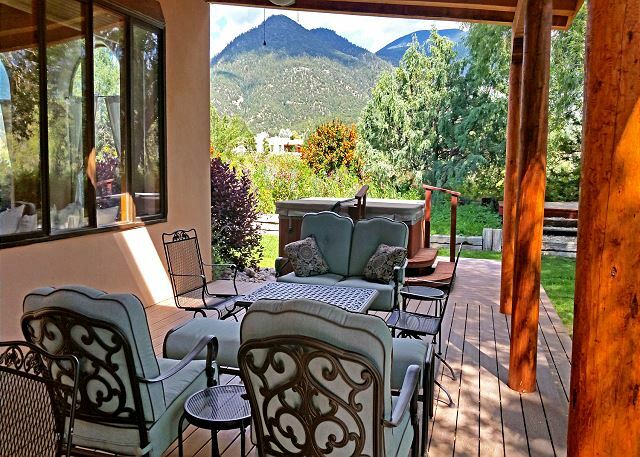 A gas grill, hammock and hot tub add to outdoor pleasures along with gorgeous mountain views and stream. 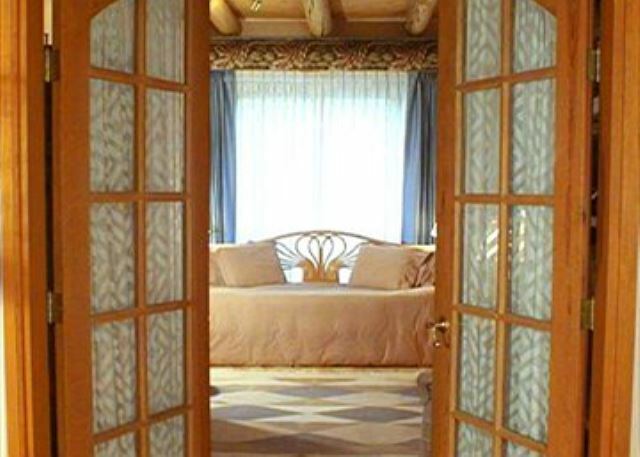 The luxury master suite with his & hers separate bathrooms + a massage room and jacuzzi tub for two makes Casa Bella a Honeymoon favorite. 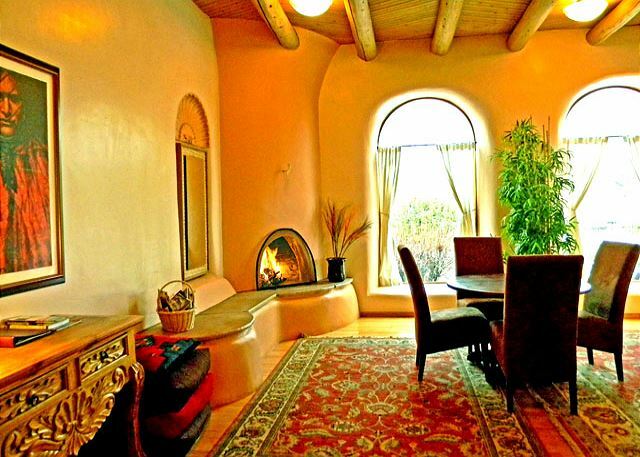 Also, rare and unique to Taos, Casa Bella comes equipped with an efficient and central evaporative cooling system that functions in desert climates only. Those who have never experienced "swamp cooling" as a form of air-conditioning are in for a treat. King (memory foam) master #1 with 2 bathrooms - one for him (with walk in shower) and one luxury bathroom for her (with huge walk in double shower + separate large jacuzzi tub for 2) makes Casa Bella a favorite for Honeymooners & Anniversaries. 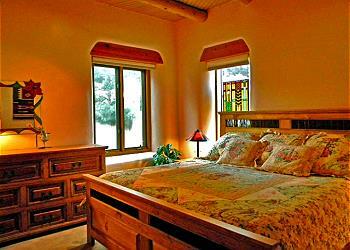 Included is a flat screen satellite TV and a Queen sleeper sofa and panoramic mountain views. 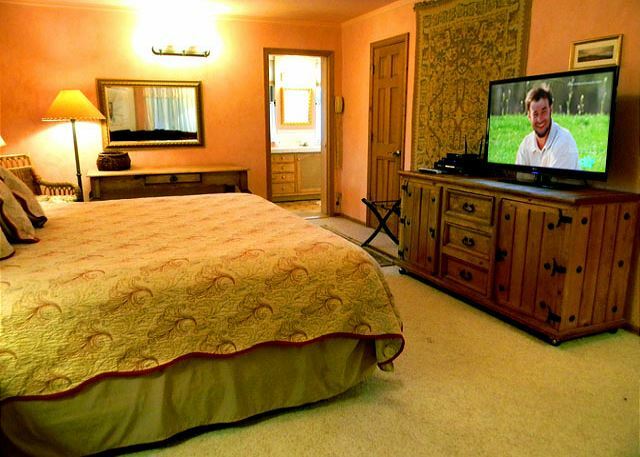 King master #2 with tub/shower combo comes equipped with a large sofa, large computer table/desk and large flat screen satellite TV. 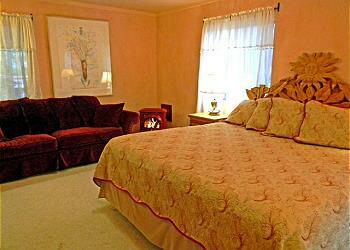 King #3 (memory foam) guest bedroom & King #4 or 2 Twins den bedroom share guest bathroom with tub. 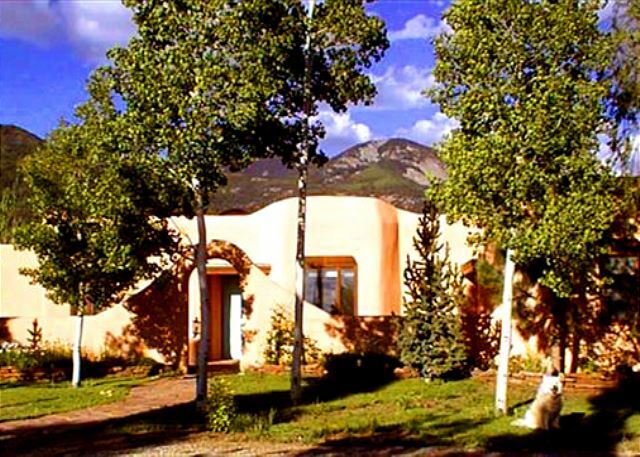 Casita Bella, (optional guest house / cabin /casita) is a full "studio guest house" perfect for 2, can sleep 2 additional children either on sofa tops or on child fold out foam 3 inch futon mats. Full kitchen and laundry, Satellite TV, stream, patio, deck and private Hot Tub can be rented separately or with Casa Bella for large groups. 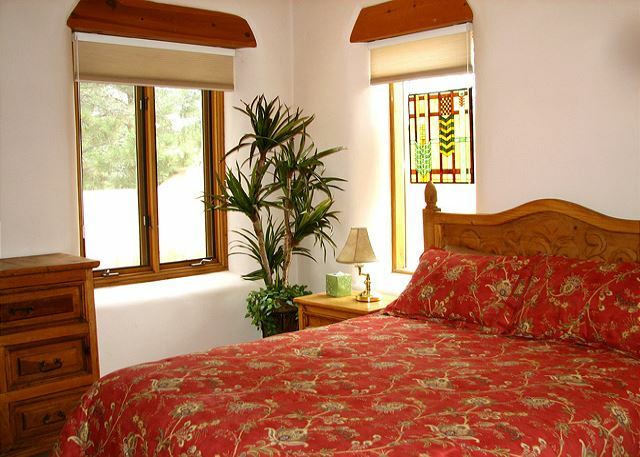 Room Description: 10 max in 4 bedrooms, 4 bathrooms (2 masters - 1 with 2 bathrooms), 2 guest bedrooms sharing a bathroom, King memory foam and Queen Slp, King Memory foam, King, King or 2 Twins (inform caretaker at time of booking for Twins). Casa Bella was a terrific place to stay. 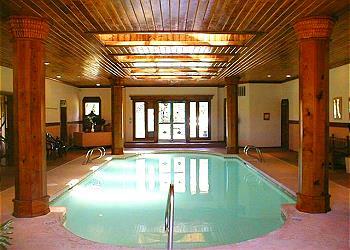 Great Home with fantastic amenities. 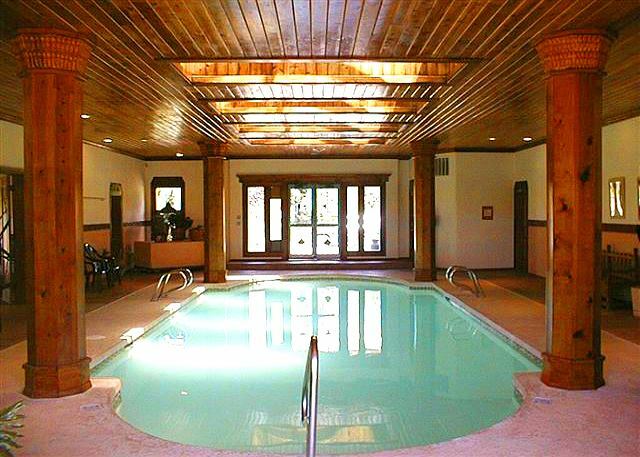 Hot Tub was clean and much appreciated after a day of Skiing. Kitchen was superb and well stocked with cookware, dishes, food wraps, etc. 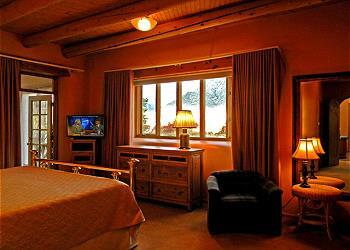 Large screen smart TV was much appreciated after a long day on the ski Hill. 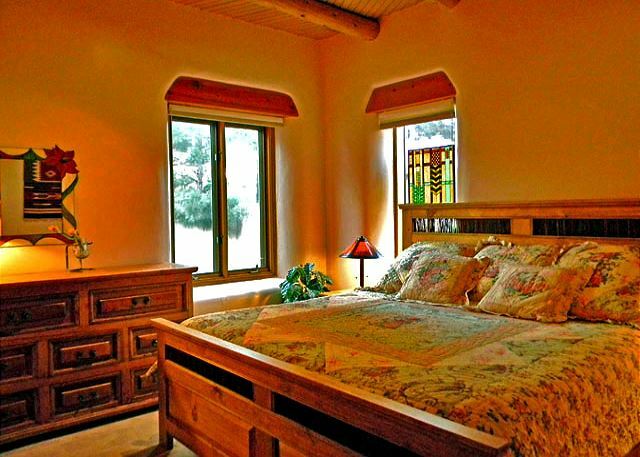 All beds, linens were extremely comfortable and clean (large supply of extra pillows, blankets, towels) A large Trex covered deck provides a beautiful sitting area to view the mountains, stream and open view behind the home. 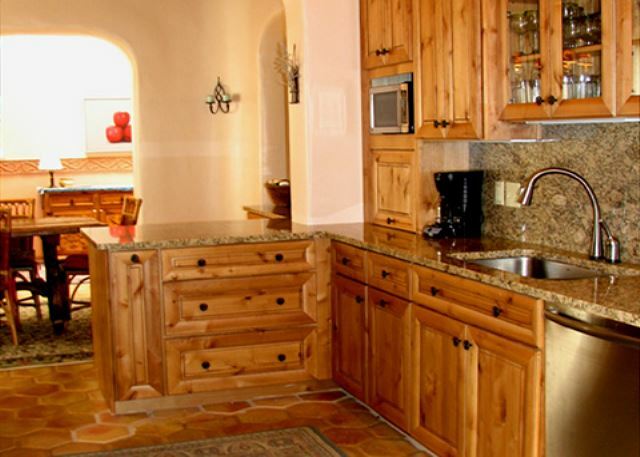 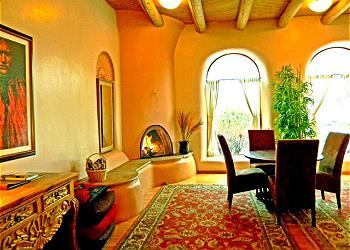 This is a great home at a great value to spend time in while in the beautiful Taos Valley area. 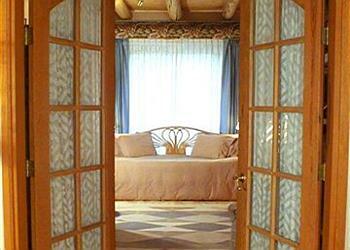 No disappointments with our booking. 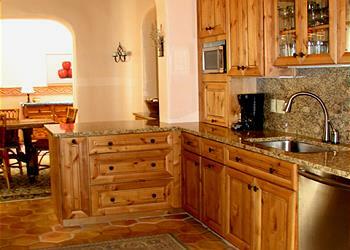 The agent and caretaker were quick to respond to our inquiries. 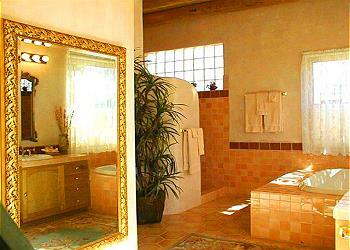 A simple contract with clear instructions were provided. Very professional organization to deal with in our experience. 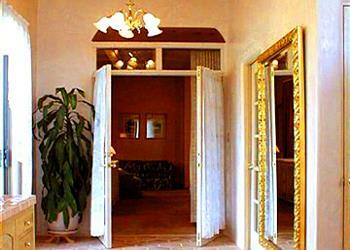 - R. S.
Lovely place! Beautifully appointed home with spacious bedrooms including one 'bridal' suite (very large master with two separate bathrooms and closets, one with a massage table). Gorgeous backyard with lots of lawn, a hammock, comfortable patio furniture and a gurgling stream. 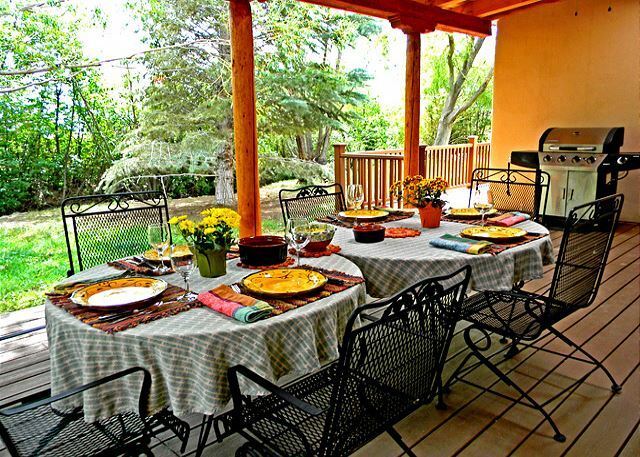 Perfect for our mini-family reunion. - Lamar J.